Our 7 day weather forecast for Lincoln updated throughout the day, making it ideal for planning leisure activities, travel and events. Read more about our weather forecasts. On Saturday 20th April 2019 the sun will rise at 05:53 and will set at 20:11. It will be a mild day, with temperatures reaching around 21.3°C. Today is expected to be a dry day, with a very low chance of rain. It will be a very clam day today, with a maximum expected wind speed of 11mph. On Sunday 21st April 2019 the sun will rise at 05:51 and will set at 20:13. It will be a mild day, with temperatures reaching around 21.1°C. Today is expected to be a dry day, with a very low chance of rain. There will be a gentle breeze in the air today, with a maximum expected wind speed of 15mph. On Monday 22nd April 2019 the sun will rise at 05:48 and will set at 20:15. It will be a mild day, with temperatures reaching around 20.2°C. Today is expected to be a dry day, with a very low chance of rain. It will be quite a breezy day, with a maximum expected wind speed of 20mph. On Tuesday 23rd April 2019 the sun will rise at 05:46 and will set at 20:17. It will be a mild day, with temperatures reaching around 17.6°C. Today is expected to be a dry day, with a very low chance of rain. It will be quite a breezy day, with a maximum expected wind speed of 19mph. On Wednesday 24th April 2019 the sun will rise at 05:44 and will set at 20:19. It will be a mild day, with temperatures reaching around 17°C. Today is expected to be a dry day, with a very low chance of rain. It will be quite a breezy day, with a maximum expected wind speed of 21mph. On Thursday 25th April 2019 the sun will rise at 05:42 and will set at 20:20. It will be a mild day, with temperatures reaching around 14.7°C. Today is expected to be a dry day, with a very low chance of rain. It could be quite a gusty day today, with a maximum expected wind speed of 25mph. On Friday 26th April 2019 the sun will rise at 05:40 and will set at 20:22. It will be a mild day, with temperatures reaching around 5.6°C. Today is expected to be a dry day, with a very low chance of rain. It will be quite a breezy day, with a maximum expected wind speed of 19mph. Our weather forecast for Lincoln is updated throughout the day and has been found to be very reliable for planning activities such as days out, leisure, travel, events, fishing, golf and gardening. 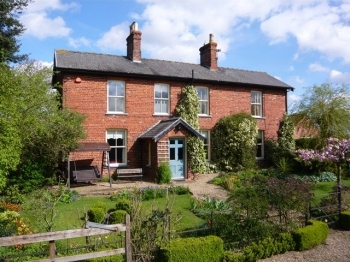 Welcome to Redhouse Farm B&B, we offer a peaceful and private bed and breakfast in our converted stables which are separate from the main house and set in four acres of paddock land in the hamlet of Whisby near Lincoln. Situated approx 2 miles off the A46 giving easy access to the historical Cathedral City of Lincoln (5 miles) and the quaint market town of Newark. Our 4 star Silver award accommodation comprises of 2 ground floor en-suite rooms overlooking the pony paddocks with ample private parking next to the rooms. Homemade cake and refreshments served on arrival in the main farmhouse dining room. Our full English breakfast is served with locally sourced produce, our own free range eggs and homemade preserves.